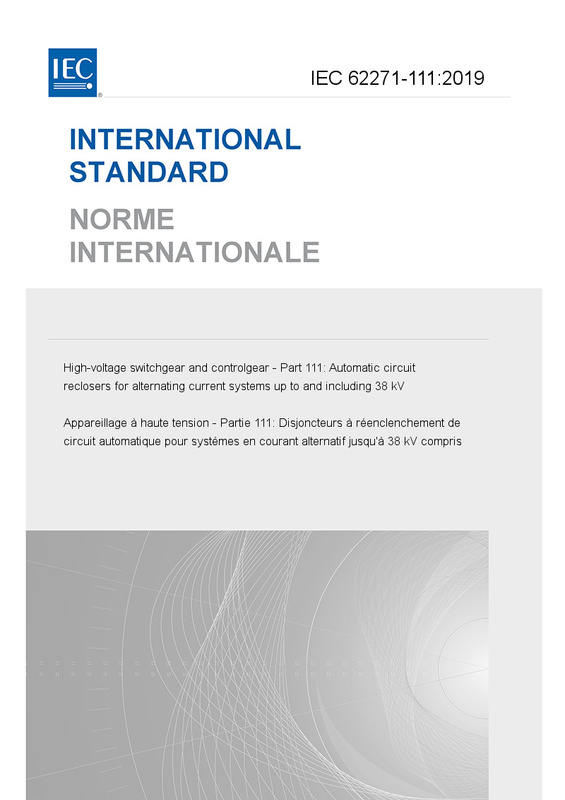 IEC 62271-111:2019 applies to all overhead, pad-mounted, dry vault and submersible single or multi-pole alternating current automatic circuit reclosers for rated maximum voltages above 1 000 V and up to and including 38 kV. Devices that require a dependent manual operation are not covered by this document. In order to simplify this document where possible, the term recloser (or reclosers) has been substituted for automatic circuit recloser(s) or cutout mounted recloser(s) or both. This third edition cancels and replaces the second edition, published in 2012, and constitutes a technical revision. The main changes with respect to the previous edition are as follows: a) Deletion of the fault interrupter from the title, scope and body of the standard including the original Annex G. IEEE will develop a separate standard for this type of equipment used primarily in North America to be designated as IEEE C37.62; b) Adoption of IEC 62271-1:2017 as a normative reference replacing both IEEE C37.100.1-2007 and IEC 62271-1:2007; c) Adoption of the “standard test method” for the conduction of wet tests for both IEEE and IEC voltage ratings, reference 7.2.7.2 and Tables 2 and 3; d) Line and cable charging tests in 7.101.6: added test voltage level requirements; e) Added test specifications in 7.103.3 and 7.103.5 for effectively earthed neutral systems (first-pole-to-clear factor kpp = 1,3) making this an optional rating. The kpp parameters are used in lieu of the system terms; f) Added low current tests in 7.104 as a replacement of the critical current tests; g) Adopted the revised allowable temperature rise table of IEC 62271-1:2017 with an increase in the allowable temperature rise for certain points in non-oxidizing gases (NOG); h) Time-current test requirements in 7.108: several changes including increased number of test current levels and tests at each level. Specified minimum number of curves to be tested; i) Mechanical duty tests in 7.109: added requirements for testing at high and low temperature; j) Replaced normative references IEC 60255-22-1 and IEC 60255-22-4 with IEC 60255-26 in 7.111.1; k) Added pass/fail criteria for fault interruption tests with restrikes in 7.112.1; l) Added Clauses 9, 10, 11, 12 and 13 similar to those in IEC 62271-1 but tailored to the recloser; m) Deleted Annex A: Information and technical requirements to be given with enquiries, tenders and orders. International Standard IEC 62271-111/IEEE Std C37.60 has been jointly revised by the Switchgear Committee of the IEEE Power and Energy Society, in cooperation with subcommittee 17A: Switching devices, of IEC technical committee 17: High-voltage switchgear and controlgear, under the IEC/IEEE Dual Logo Agreement.